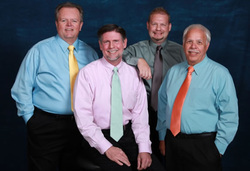 Shrimp ‘n Grits became an official, registered quartet of the Barbershop Harmony Society in February, 2013. They were a Top 10 Finalist quartet at the Carolinas District Convention in October of 2013. All quartet members also sing with the Palmetto Vocal Project, a championship men’s barbershop chorus located in Mt. Pleasant, SC. Richard Harris (Tenor) is a long-time barbershopper and has been a resident of Summerville, SC for many years. He is a dual member of both PVP and the Charleston Barbershop Chorus. He serves as the Treasurer of PVP. Steve Cowart (Lead) is a resident of Mt. Pleasant. Steve sang in show choirs and choruses in college, and currently sings in his local church choir in addition to singing with PVP. He is relatively new to the barbershop style, but has fallen in love with the harmony and fits right in. Shawn Whisenant (Bass) comes to Charleston from the West Coast where he sang with the International Chorus Champions, Masters of Harmony. He serves as a Board Member at Large of PVP and resides in Summerville, SC. Mikey Mancuso (Baritone) relocated to Mt. Pleasant, SC from Columbus, Ohio, where he performed for many years with the Singing Buckeyes Chorus, and also International Top 10 chorus, The Alliance. Mikey was a founding member of PVP, and was its first President. He currently serves as the Immediate Past President of the chapter.